LAKE FOREST, CA--(Marketwired - Jul 17, 2015) - Homebuyers are discovering the path to happiness leads directly to Brookfield Residential's brand-new El Paseo in The Village of Foothill Ranch, one of Orange County's best new home buys. This beautiful new townhome community is attracting a range of savvy buyers, including Uma Mandadapu and his wife Sasi Gummadi who recently purchased El Paseo's spacious Plan 5, a gorgeous 3-bedroom home that will beautifully accommodate their growing family. "My wife and I have wanted to purchase a new home for well over a year, and when we found out we were expecting our second child, I knew it was time to fulfill this dream," explains Uma. "A few days after we learned about her pregnancy, I toured the El Paseo models, and within 24 hours, I returned with my wife and surprised her by putting down a deposit on our new home. She was very overjoyed!" As a first-time homebuyer, Uma was unsure how the purchasing process would proceed from there, but working with El Paseo's sales team quickly eased his worries. "I looked at other homes before finding El Paseo, and I can tell you that the sales teams I met were nothing like Brookfield Residential's sales representatives Brigitte and Carin are absolutely the best. They were both extremely patient and helpful, and were clear and precise every step of the way." The home buying experience and loan process were exceptionally streamlined, as well, which was a pleasant surprise for Uma. "I'd heard from friends that buying a home can be incredibly tough, but our experience with Brookfield Residential went so smoothly I thought I must be missing something, but I didn't miss a thing, the whole process was surprisingly easy." Prior to his new-home purchase, Uma noted that there were plenty of resale opportunities available, but after careful consideration, he decided that buying new at El Paseo was the best choice for his family. "El Paseo was a natural fit for us for a lot of reasons, one of course being the beautiful selection of brand-new homes," Uma remarks. "We liked Plan 5's open living spaces and the way the rooms are so easily accessible to one another, especially the way the great room leads to the private courtyard. Having that contained outdoor space for our kids to play and run around is a feature we'll value through the years." The setting within The Village of Foothill Ranch was also a major draw for Uma and his family, offering a host of lifestyle advantages that are hard to beat. "We have so many conveniences near our new home that will keep us active and connected to the community. We can hike and walk in the park, shop nearby, visit the library and take the kids to The Cabana's playground or pool, it's a great community, filled with educated professionals who want the same family-friendly setting as we do." Uma and Sasi greatly value El Paseo's Orange County location, which is close by to family and friends, and includes a crucial benefit for their children. "Our children's education is incredibly important to us, and knowing that we have access to excellent schools right near home is invaluable," he says. "Overall, I can't imagine a more ideal place to raise our family." El Paseo's enviable setting, beautiful new townhomes backed by Brookfield Residential's home warranties, low taxes and low HOA fees have clearly made the neighborhood a must-see for those seeking the best lifestyle for their families. To learn more, interested homebuyers are invited to visit the Welcome House today to tour the six professionally decorated models and take advantage of long-term rate lock programs through iMortgage. For more details, log on to www.BrookfieldSoCal.com. El Paseo's authentic Spanish-inspired architecture and six attached-home designs effortlessly accommodate every lifestyle need with stylish floorplans ranging from approximately 946 to 1,795 square feet, with 1, 2, and 3 bedrooms, up to 2.5 baths, and 1- to 2-car garages. The interior layouts are designed to flow easily from one room to the next, creating a spacious atmosphere that invites family time and encourages socializing. Design elements that are common in every floorplan include large great rooms for entertaining; modern kitchens with granite countertops, stainless steel Whirlpool® appliances, and European-style white thermofoil cabinetry; cultured marble countertops in all baths; and spacious master bedroom suites with walk-in closets. Select plans also feature first-floor dens, patios, outdoor decks, and private courtyards. El Paseo's 1-bedroom floorplans start from the high $300,000s, 2-bedrooms from the mid $400,000s and 3-bedrooms from the mid $500,000s. Between El Paseo's dynamic setting in The Village of Foothill Ranch and its spectacular Orange County location, residents enjoy a truly enviable way of life with a host of leisure and lifestyle opportunities at every turn. The community's hub of recreation is The Cabana, a private recreational center that gives residents access to a swimming pool, multi-purpose room, playground, great lawn for picnics and numerous community barbecues, while just steps from home, they'll find a Target, the Regal Cinemas, the Foothill Ranch Town Centre, and a number of popular restaurants. The 241 Toll Road is also nearby conveniently offsetting the hassles of work commutes. El Paseo homeowners with school-aged children will appreciate inclusion in the respected Saddleback Valley Unified School District. To visit El Paseo at The Village of Foothill Ranch from I-5, exit Bake Parkway and head east. Turn right on Portola Parkway, make your first right on Auto Center Drive and then turn right again on El Paseo. The Welcome House is located on your right and is open daily from 10 a.m. to 6 p.m. and Wednesdays from 2 p.m. to 6 p.m.
For more information on El Paseo, call 888.598.1632, or visit www.BrookfieldSoCal.com. Prices effective date of publication. Brookfield Residential Southern California (Los Angeles and San Diego) a division of Brookfield Residential, is committed to being more than a homebuilder. We strive to create the best places to call home. The Brookfield Residential Southern California (Los Angeles and San Diego) team has the passion, the expertise and the local knowledge to craft homes and neighborhoods that speak to homebuyers at every stage of life. We are an award-winning homebuilder and industry leader with an exceptional reputation for quality, design, and customer service. Brookfield Residential Properties, Inc. is a leading North American land developer and homebuilder. We entitle and develop land to create master-planned communities and build and sell lots to third-party builders, as well as to our own homebuilding division. We also participate in select, strategic real estate opportunities, including infill projects, mixed-use developments and joint ventures. For more information, visit www.brookfieldresidential.com. 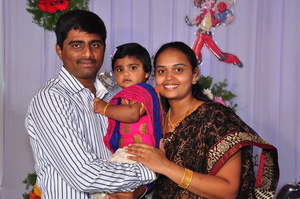 Uma Mandadapu and his family purchase a Plan 5 at Brookfield Residential's El Paseo neighborhood.